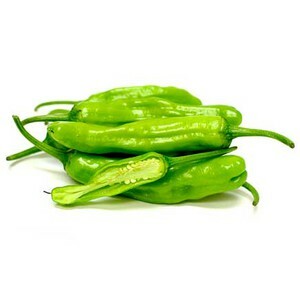 Padron peppers are a mildly spicy chile in the Capsicum family. Though these peppers are from South America, the name Padron comes from the town in Spain where they achieved culinary fame in the 18th century. Every year for the past 35 years, the nearby town of Galicia celebrates the pepper with a month-long culinary festival in the peak of Padron season. Padron chiles are heirloom and were relatively obscure outside of Spain until the past few decades. Now, they can be seen at farmers markets in California and the American South. Padron chiles are often enjoyed as a snack food, so many harvesters pick them before maturity. Capsicum peppers produce more capsicum (meaning more heat) as they age- young Padron chiles boast a mellow heat (around 500 units on the Scovile Heat Unit Index) and bright, earthy flavor notes. However, even when picked young, Padron chiles are somewhat of a snacking gamble. 90% of the time, these chiles are relatively mild, but every once in a while there's a surprise pepper in the batch that, by virtue of gardening's fickle nature, shocks diners with a burst of jalapeno-like fire. That shouldn't stop you from chowing down on these chiles though. Padron peppers seared in olive oil and sprinkled with sea salt is one of the most popular tapas dishes in Spain. These peppers are meltingly tender which makes them a lovely addition to creamy or cheese-laden dishes. Like most capsicums, Padron chiles are a good source of Vitamin A, B vitamins, Vitamin C, calcium, and iron, making them one of the healthier snack foods you can eat with your fingers.